I wanted to present this interesting case to you of a young girl with a common condition - osteochondritis dissecans (OCD). She came to me at 8 years of age with a painful knee but no history of injury. She was unable to bear weight on that side and had very disturbed sleep due to the severe pain. An MRI scan confirmed classic osteochondritis dissecans. This is a condition where a discrete area of bone underneath the joint cartilage starts to die from interference to its blood supply, the reason for which is not well understood. With time the affected bone may break off from rest of the bone. The overlying joint cartilage may also die and break down. 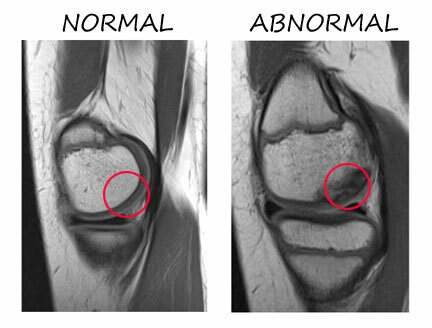 If you look at the two MRI scans on the right, it may not be altogether easy for you to interpret, but the slices are through the rounded condyle of the femur, with the normal knee on the left and the affected knee on the right. Looking inside the red circles one can see on the left that the bone (whitish) and layer of overlying joint cartilage (greyish) are both smooth and intact. In the red circles on the right, however, the bone is not at all healthy and has lost its clear rounded contour, while the overlying cartilage is thinned and boggy-looking, although still intact. The MRI on the left is showing the lesion from a different angle and with a different contrast. The fragment was stable on the MRI, so I treated her non-operatively for 4 months on crutches hoping it would settle. Unfortunately, it didn't, so I took her back to the operating theatre (OR) in November. 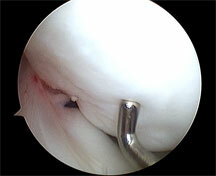 If you look on the right at the first of the photos taken during arthroscopy, you can see the shiny probe pressing into the overlying joint cartilage. It is clear that it is softened, allowing the rounded probe to dimple its surface. 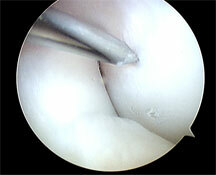 Normally the cartilage is quite firm and does not allow this dimpling. I decided to undertake microdrilling arthroscopically, which you can see in the second arthroscopic photo on the left of the needle being passed through a sheath and drilling into the underlying affected bone in order to release marrow cells and hopefully improve blood supply. I also inject PRP (platelet rich plasma) into the area. PRP is basically the plasma from the patient's own blood, and which has been enriched with platelets. PRP contains growth factors that stimulate healing. Below you will see the video taken during the arthroscopic surgery, and demonstrating the probe being used to examine the structures inside the knee. 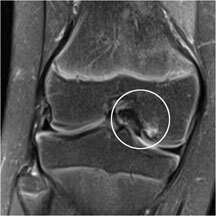 You will see initially the anterior cruciate ligament and the normal rounded condyle on the good side, as well as the wedge-shaped meniscus. The probe goes over to the bad side and focuses on the softened joint cartilage, where you can see the dimpling I was talking about. The response to the surgical intervention and the PRP was excellent and her symptoms were totally cured at 8 weeks. These two photos demonstrate a return to full pain free extension and flexion. The reason I wanted to present this case to you is that it is a common presentation of knee pain in children. Usually the treatment is non-operative as mostly they are stable lesions. If, however, they are unstable then they need fixing (less common). However, stable lesions sometimes just don't settle- these need drilling as opposed to fixing as they are stable and we just need to stimulate the underlying bone to heal. PRP is new and helps the healing process in tendinopathies, muscle tears, wound healing - so I figured "Why not OCD lesions?" This is the first time I know of that PRP has been used in this way. We obviously need to write it up - it isn't rocket science and the effect was truly remarkable as she went from terrible to healed and normal in a matter of a few weeks!